Is swiftmend off cooldown? 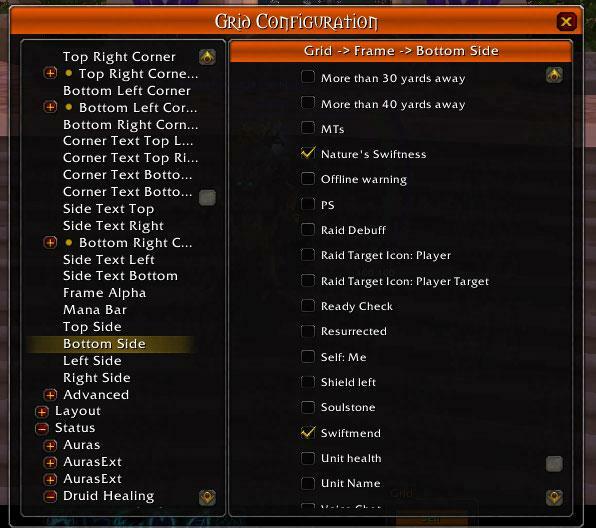 This can be handled by a non-grid addon that tracks cooldowns. Is there a swiftmendable hot on the target? If you’re running with another druid, tracking just your own hots is not enough. This data point can be handled in grid by tracking all swiftmendable hots on the target using one indicator. Healing Through Stupid has an amazing guide detailing this simple, elegant method that requires absolutely no plug-ins. If you want to use Nature’s Swiftness, just make sure it’s off cooldown. You can figure that out pretty easily, eh? I am lazy, and for both Swiftmend and Nature’s Swiftness, I use GridStatusSwiftmend. You set the color and tell it what your preferred health threshold is. I picked 60%. Above 60% and I don’t care. Sure, I do swiftmend targets above 60%, but if they all lit up like Xmas trees above 60%, I’d have TMI. So I only have it “remind” me that I can swiftmend targets under 60%. Check it out! I set my threshold here to 30%. I also have it only show up on tanks, because I am not gonna blow my 3 minute cooldown on a suicidal DPS. Notice how the priority is higher than that of swiftmend. This is because I will want to show them in the same place on my grid frame, but I will want the Nature’s Swiftness to show if the conditions above are met, even if swiftmend is also available. 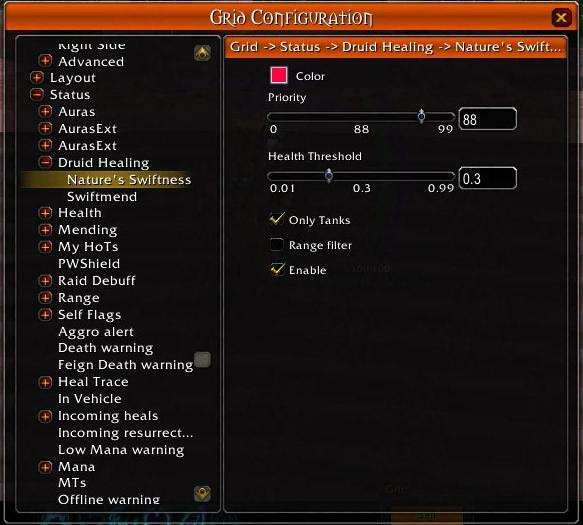 Yes, I have confirmed, the Nature’s Swiftness indicator does work for shaman, even though it says “druid healing”. I tested this by jumping off something high. I put both on the bottom edge. Yes, I know, this requires another download (GridSideIndicators). Remember, Nature’s Swiftness has a higher priority. Are you ready? It’s gonna be awesome. Falling off stuff in the name of science. 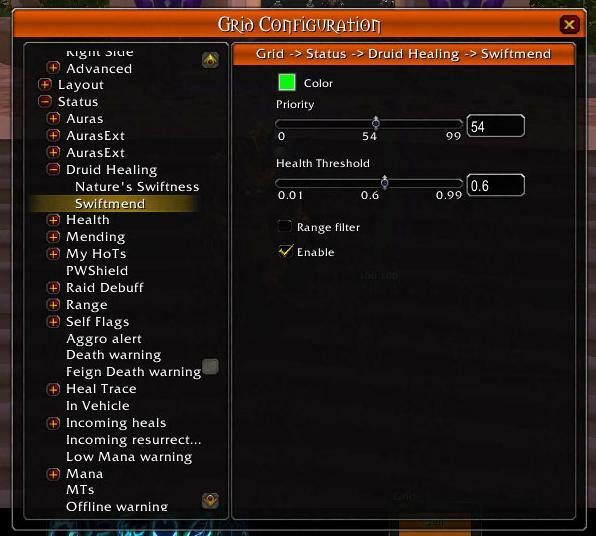 my swiftmend is off cooldown. Although I am below 30% health, the Nature’s Swiftness indicator will not trigger, because it is filtered to only show on tanks.